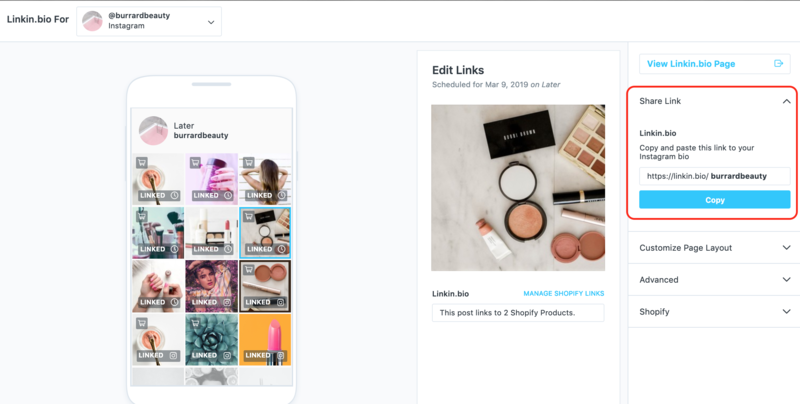 Linkin.bio helps you build a clickable, shoppable, Instagram feed so you can direct your followers to the right content and product pages right from your Instagram bio! 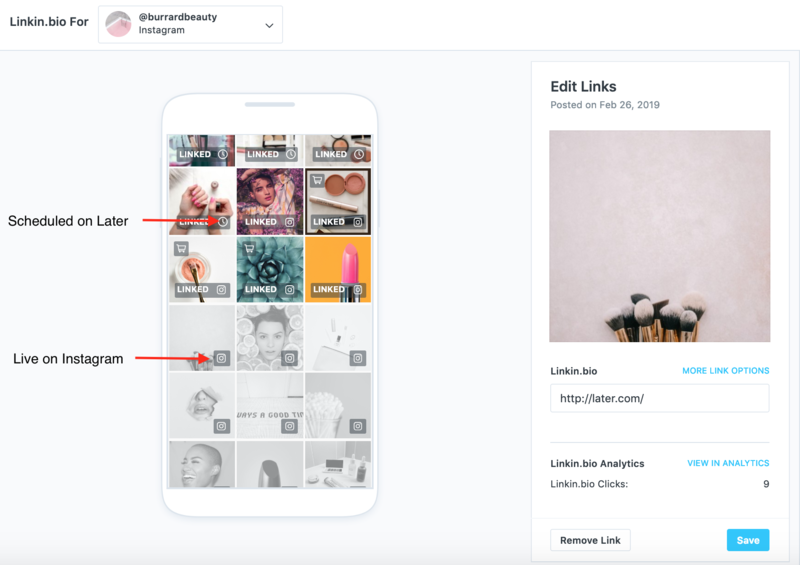 By adding links to your posts, you can begin to design an interactive page that is meant to look and feel just like your Instagram feed. Linkin.bio is not the same as Instagram's product tagging feature. It does not tag your posts right on your Instagram profile. Linkin.bio is a mobile and web optimized page that displays your Instagram posts as clickable images. Your Linkin.bio page link should be displayed in the website section of your Instagram bio. You can add one or multiple links to a single post. Add links to posts while scheduling, or link posts that have already been published to Instagram from the Linkin.bio management page. From the Later mobile app you can only add links while scheduling a new post. To manage all other posts & links go to Later on your desktop. Connect your Shopify store to Later and start tagging your Shopify products to your Linkin.bio page. Important: Linkin.bio can only be set up from your desktop. Here you'll be taken through a set up wizard! Click Setup to get started. 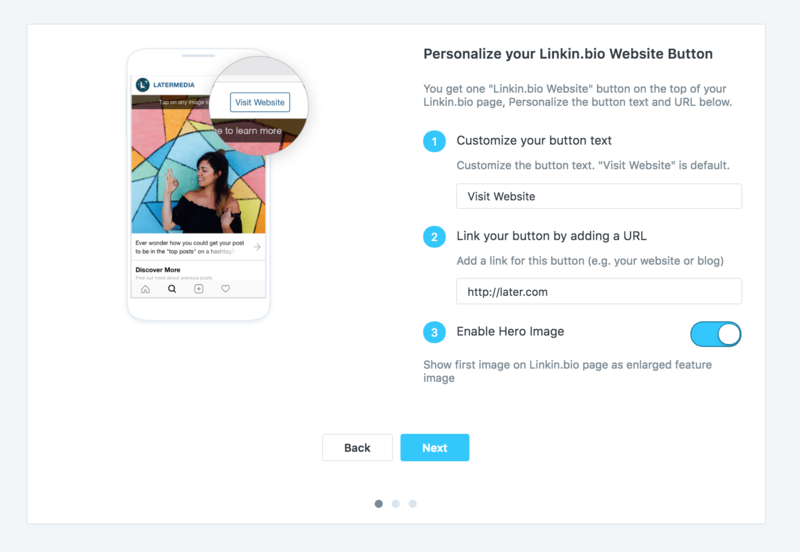 An action based button at the top right corner of your Linkin.bio page: we recommend making the button's text clear, for example "Visit Website". Link your button: we recommend linking to your homepage, but we leave it open to your unique business needs. Enable/Disable Hero Image: this is an enlarged image of your last published photo to help highlight or showcase the most recent post. 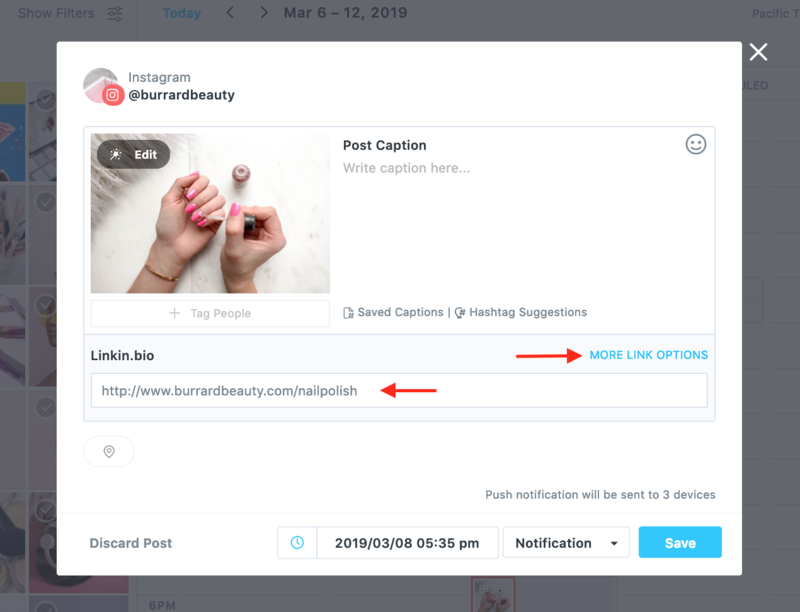 Once enabled, you can start linking your live Instagram posts, or add links to your scheduled posts. 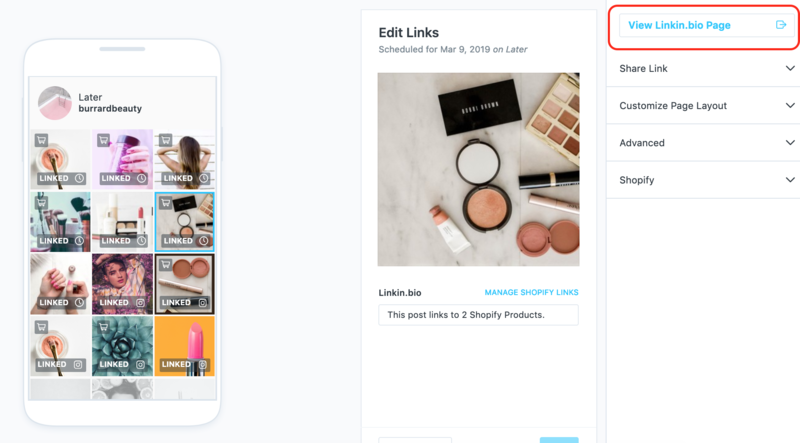 If you have a Shopify Store, set up your store with Linkin.bio to start tagging your products. Link posts that are live on Instagram. From your content calendar, open your scheduled post to add the link(s) you want to direct your audience to. Add a single link to a post. Add multiple links to a post (maximum of 5 links). Connect your Shopify store in order to tag your products! Add links to posts you've already published to Instagram from your Linkin.bio management page. From Later's content calendar, go to your Linkin.bio management page. 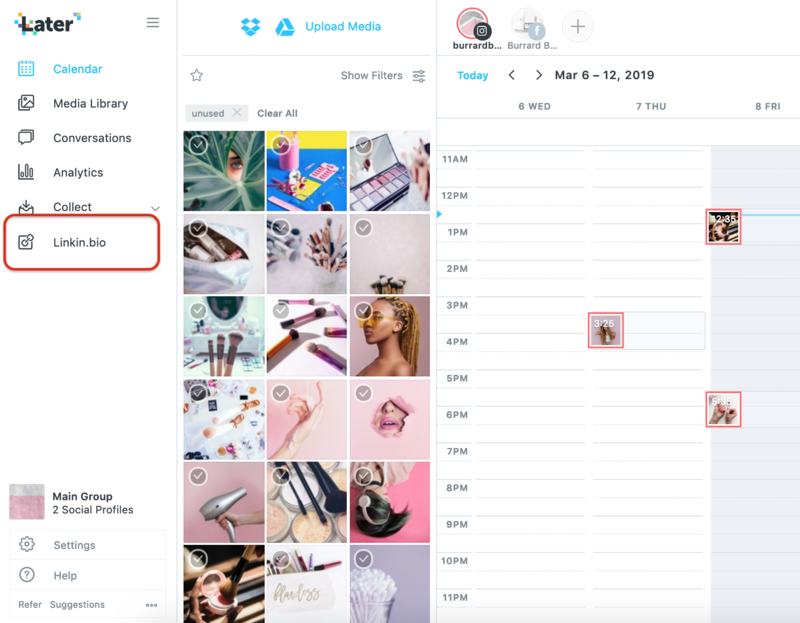 You will see your Instagram feed with all of your scheduled posts (clock icon) and posts that are live on Instagram (Instagram icon). Add multiple links within 1 post (maximum of 5 links). Connect your Shopify store in order to tag your products. Once you have added links to past posts, you can check out what your Linkin.bio page looks like! To make your Linkin.bio page accessible to your followers from Instagram, add your Linkin.bio link to your Instagram bio. The Linkin.bio link will need to be added into the website field. That means removing your actual website link and simply having your Linkin.bio page as your main webpage. From your Linkin.bio page click Share Link and copy the link. Go to Instagram.com and click Edit Profile. Finally, paste the link into your website field and you're done! 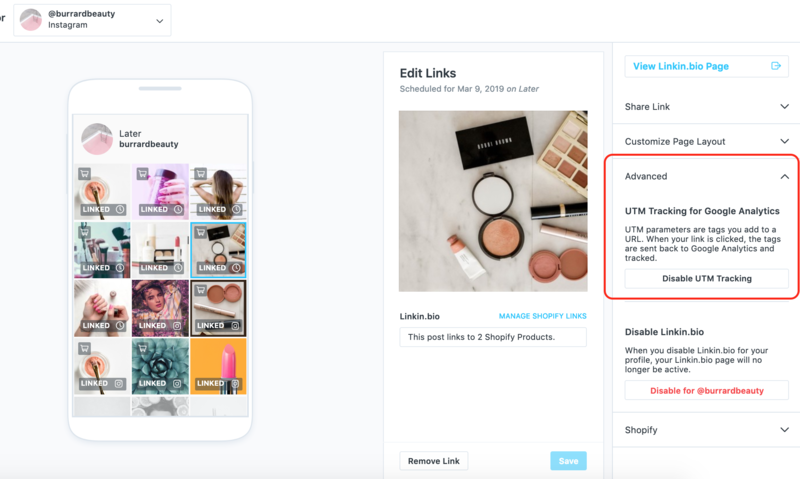 If you're already using Google Analytics to track conversion and sales, you can enable Later's UTM tracking to make the tracking process easier. Important: if you are already adding your own UTM parameters to links, you do not need to enable Later's UTM tracking. This will interfere with the tracking. From your Linkin.bio management page, click Advanced on the right side menu. 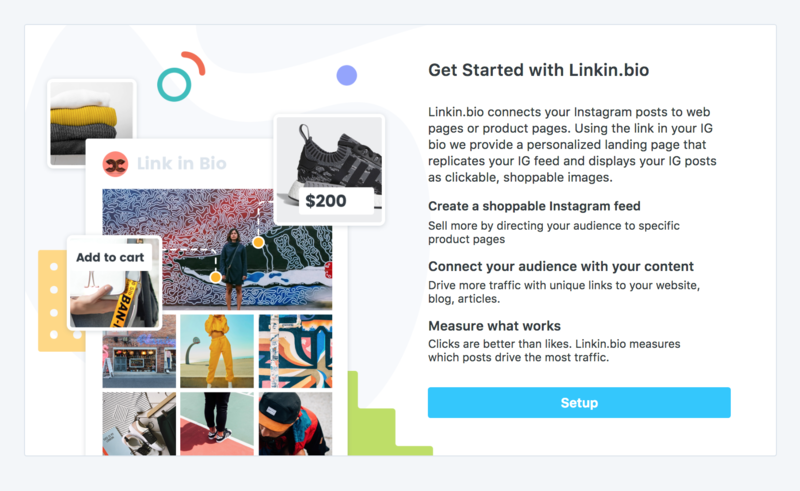 With your Linkin.bio page helping you drive more sales and traffic from your Instagram profile to your product pages, it’s important to monitor the clicks and visits your Linkin.bio page generates over time. You can find out more about Linkin.bio Analytics here.